Catching up on my WordPress Reader I found a number of Bloggers reviewing their 2017 blogging year. At one end of the spectrum was the unbelievably dedicated, productive Alec Nevala-Lee who revealed he has written a 1 000 word blog post every day of this year. Respect, Alec! How did he do it? We all know perfectly well how he did it. He single mindedly sat down and applied himself until his daily piece was written. This, mark you in addition to his work as a novelist and freelance writer. At the other end of the spectrum I read a post by 746 Books in which Kathy confesses that 2017 was not a productive blogging year for her. She said it had been difficult to carve out time for writing on her blog, and that her reading (she’s a bookworm, like me) progress had been unsatisfactory. She wondered whether she should stop blogging altogether? These salutary thoughts on her 4th Blogoversary. I know how she feels. Whilst I am not in her league when it comes to compulsive book buying, it is a factor in my life. Let’s face it, I’m more of a reader than I’m a writer. Then I read Ann V Klotz post titled Writing is Everything. Do I feel that way? No, I don’t, but part of me wishes I did. The title is a little misleading, in that she details the myriad events that keep her from the keyboard. I know the feeling well! I am experiencing December fatigue after a busy year. The end of November and beginning of December are always hectic in South Africa. On 16 December the entire country pretty much shuts down – industry, the building trade, anything that is not retail or hospitality related. Try getting anything done between now and 08 January 2018. Fuggedabtoutit, as the Americans say. So the build up to 16 December is frantic. Everyone trying to get projects completed before shut-down. Social clubs and organisations cramming in their year-end staff parties/thank-you ceremonies/ etc. By December 16th the nation is in a soggy heap, ready to go on holiday and start (or continue) partying. Do I feel like blogging? Not really. Hopefully by January 2018 I will have rested and recovered, enjoyed a relaxing Christmas Family Visit in Durban, and be ready to resume my blogging . Meanwhile: Wishing all a peaceful Festive Season with your families and friends, and a happy, healthy New Year. Oooops, no, not quite. My alter-ego and companion Chocolat has a few scornful final words to add to my post: She says: My Personal Assistant should do as I do . Life really is so simple : find a comfy, sandy spot under the shady karee tree, and relax. 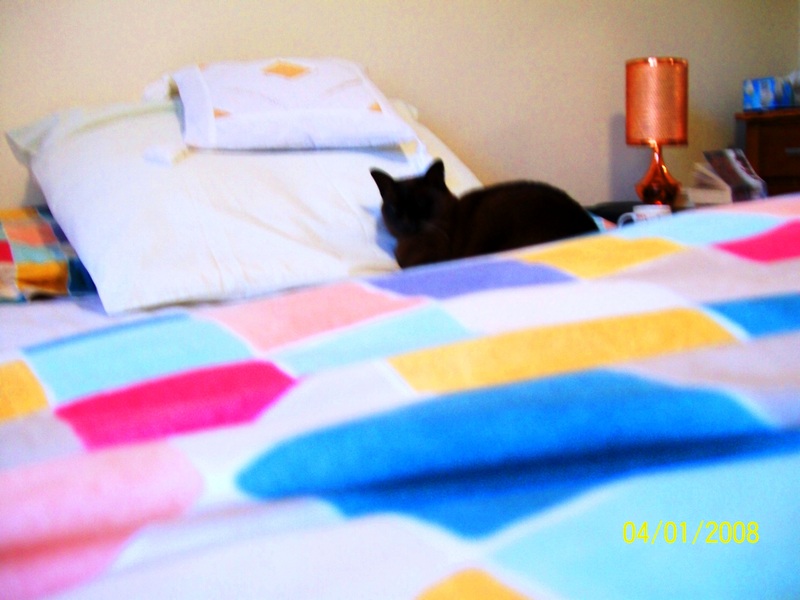 Saunter indoors for a cooling sip of water and then continue napping on the PA’s feather duvet. What’s all the fuss about? It must be the time of year – early summer – or the arrival of the South-Easter, or the phase of the moon – whatever it is, my cat Chocolat is filled with bloodlust and comes home almost daily, bringing me PRESENTS. Those of you who work as Staff for Cats will know what I mean. She comes trotting through the door and instead of her usual loud greeting, all I hear is a suspiciously muffled call. It’s muffled because she has a mouthful of bird, or small creature, usually alive, if not actively kicking. Oh dear. Not again. I leap up, but she’s a lot nippier than I am, and always dives under the bed with her latest prey. If the little body is limp, I leave her to it, and close the bedroom door until she’s finished. Urrggghh. But if the creature is alive, kicking and bent on escape we then have a three-ringed circus: cat v.s. human and prey; prey v.s. human and cat; human v.s. cat. I have recently caught small birds desperately trying to fly away and stunning themselves on the glass. It just depends who gets to them first – me or Chocolat. Rescued birds don’t do well, I think it’s the shock that kills them. Mice are a better bet. I rescued a charming yellow-striped Cape mouse last week, managed to catch him with my famous braai-tongs, and release him over the neighbour’s garden wall, with Chocolat watching angrily from the locked bedroom. Those braai-tongs are wonderful: not only do they enable me to pick up small objects at floor level, they make an excellent rescue tool too. Because they have a long handle I’m able to reach under tables, cupboards and into corners. I even managed to rescue a lizard, lying on my bedside mat – lizards are the devil to catch, not only are they very quick but they shed their tails as a get-out-of-jail card, and usually all you’re left with is the discarded twitching tail while the lizard has hidden in an even more inaccessible corner. Big grasshoppers are the worst, and Chocolat loves them – they’re so lively, and interesting and provide hours of fun. Major fun! For her, but not for me! By now I must be well on my way to Bodhisattva status due to my rescue work. What fascinates me, is that Chocolat dines lavishly on high quality cat kibble, so she’s not hungry. She just enjoys the sport. Proof of which are the shrews. She hauls them inside, leaves them under the bed and walks away; apparently cats won’t eat them because have a bitter taste. I ask myself : then why bother in the first place? But I know the answer to the rhetorical question : cats are hardwired to hunt. But what really gets my goat, is her attitude to proffered tasty titbits on a saucer, after my meals. She will approach the saucer with more caution than a Bomb Squad Disposal member approaching suspect terrorist unexploded ordnance. Having established that the saucer and titbit might be edible, she then carefully sniffs and examines the food like a nervous guest at a Borgia banquet …. and then has a cautious nibble. She might then condescend to eat the titbit. CATS!!!! Sigh. So basically I’m harbouring an efficient cold-blooded killer, dressed in a sleek brown fur coat, and disguising her true nature by playful winning ways. Hmmmm. What a relief to be back home, relaxing on our bed as you can see from the pic above. I cannot tell you how cold, wet and miserable That Place was, and how pleased I was to be back in a warm house, with my staff in attendance, and the choice of three comfy beds to lie on, plus usual access to my morning sunbathing venue under the hedge and my afternoon basking venue easily available. Just to be on the safe side I’ve been extra polite, and putting in extra purring sessions to make sure I don’t get sent back to That Place. It really was too terrible. Recalling my time there makes my whiskers curl and gives me the shivers. Oh – and by the way, She is B.A.K. (back at keyboard).